Battlescene on the Somme - French Infantrymen known as Poilus, going over the top with bayonets fixed. 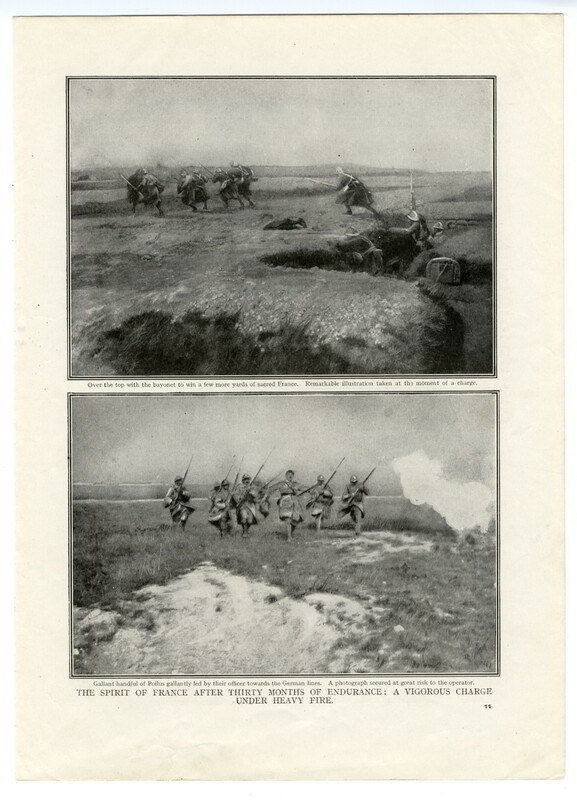 A full page showing two photogaphic images which almost look like drawings; the page is entitled The Spirit of France After Thirty Months of Endurance: A Vigorous Charge Under Heavy Fire. They show a group of French Poilu or Poilus (infantrymen) going over the top with bayonets fixed, and charging towards the German lines. The caption reads "......remarkable illustration taken at the moment of a charge." On the reverse are two smaller photographic images within text titled: German "Pigeons" Bagged by the French showing small wing bombs taken from the Germans on the Somme, by the Poilus. The other is entitled Bombs and Grenades Captured on the Somme showing boxes of munitions in various forms. Part of the caption reads "...a photograph secured at great risk to the operator."